Nanu was recently rescued from a neglect situation by Empty Cages Collective. She was dropped (literally) by her previous guardians resulting in two terribly damaged knees and legs. After being denied care for this issue, Nanu developed a life threatening infection. Empty Cages Collective found out about Nanu’s plight from another rescuer and rushed into action to help her. After receiving emergency surgery for a runaway pyometra infection, Nanu went to an ECC foster home to recuperate. 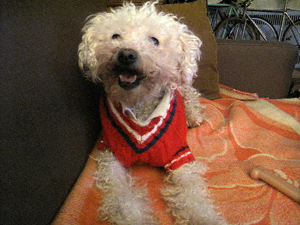 You can read more about Nanu and tender a donation towards her medical expenses by clicking here. Happy birthday P.J.! I donated when I first saw this, poor baby! I hope she finds a wonderful home once she’s all healed up.